BASF offers a broad portfolio of Aerospace materials and technologies that can provide unique solutions across a wide range of applications- cabin interiors, seating components, secondary structural materials, additive manufacturing, performance additives and pigments, coatings and sealants, fuel and lubricant solutions, flame retardants and fire protection, and many other innovations. Recyclable Wear Resistant Elastomers -- Elastollan Thermoplastic Polyurethane (TPU) allows the design of soft touch and highly abrasion resistant interiors parts such as armrests, electronics housings, and high touch surfaces. FST compliant. Supracor's Stimulite Cushions — made with Elastollan TPU this is a fully recyclable solution for aircraft seating that provides extreme comfort, freedom of design, light weighting, and space savings. FST compliant. High Temperature Thermoplastics -- Molded shapes and foam core materials made of Ultrason E and P are recyclable, durable, and FST and OSU heat release compliant. All Thermoplastic Panel for Aircraft Interiors — made from Ultrason PES. A recyclable alternative to polyaramide honeycomb providing 10% weight and 55-65% labor/time savings. These panels have a superior surface finish and damage tolerance. FST and OSU heat release compliant. Ultramid FST Compliant Polyamides — for cabin interior components such as meal trolleys and latches combine processability and design flexibility with high tensile and impact strength. Unreinforced and glass reinforced options available. Thermoformable Composites — a formaldehyde free, very low emission binder system which can be used to make fiber composite components up to 40% lighter. Processed using traditional thermoplastic cold forming or thermoset methods, Contoura provides superior mechanical stability, a long shelf life, and FST compliant formulations. Engine Mounts, Vibration and Shock Isolators — Cellasto micro cellular PU is a light weight alternative to rubber providing durability, versatile design options, and up to 50% weight savings. Recyclable Thermo-Acoustic Insulation — Basotect UL melamine foam is light weight and sustainable with no land filling required (compared to glass fiber insulation). It is used in applications such as cabin walls and ducting. Catalytic and Ozone VOC Converter — Deoxo catalytic converter provides pleasant cabin air free of ozone, and have exhibited superior catalyst life, durability, and cost effective maintenance. BASF also offers competitive pricing for functional evaluation, maintenance, and repair services with short lead times. Powder Injection Molding — Catamold metal or ceramic injection molding allows the economical fabrication of highly complex ceramic and metal parts near net shape. Thermoplastic Composites for Metal Substitution (tray tables, seat backs, etc.) — Ultrason polyethersulfones for injection molding and extrusion applications are recyclable and light weight. Carbon fiber reinforced parts can be used as structural materials in applications requiring high strength and impact resistance. These materials offer significant strength to weight advantages over aluminum. 40% Lighter Load Bearing Floor — Using BASF rigid polyurethane foam systems formulated to meet FAR 25.853, our prototype sandwich panel provides significant weight savings over traditional aluminum flooring while supporting a 4,200psi compressive load. Engineering Plastics Filaments — BASF is partnering with a filament market to bring engineering plastics including Ultrason PESU, Ultramid PA, and Elastollan TPU to the market for FFF applications. This technology provides improved Z strength and inherent EMI shielding properties. Polyamide 6 Sintering Powders — BASF is developing Ultramid PA6 powders for SLS. Current development materials are not FST compliant for aerospace applications. Stainless Steel 316L Filled Filament — BASF is in the soft launch phased with stainless steel 316L filled filament that can be used on the FFF technology for lower cost 3DP metal parts. HP Partnership — BASF is one of the founding material companies on HP’s Open Materials Platform for the Multijet Fusion technology. We are developing sintering powders for use in HP processes. Photopolymer — Several photopolymer technologies are being developed for stereo lithography and jetting applications. BASF formulations have higher impact strengths and comparable HDTs. Heat Reflective Cool Pigments — These pigments can be used in coatings reduce heat buildup by increasing IR reflection thereby keeping your cabin cool and energy consumption low. Performance Pigments — provide dramatic color effects, high reflectivity, and unique finishes for interior and exterior aerospace applications that allow for thin, lightweight, and durable coatings. UV Absorber Technology — Tinuvin CarboProtect is UV protection for epoxy based composite materials providing unmatched photooxidative stability. Solyfast Photo Latent Catalyst — is a tin-free metal catalyst that activates when exposed to UV light providing fast curing with reduced energy consumption. It is compatible with HDI based polyisocyanates and 2K-PUR and can be processed at low temperatures while providing a long pot-life. Solyfast reduces waste and the curing footprint while providing a healthier working environment and sustainable coatings operations. UNO Single Stage Polyurethane Coating — Meets AAMA613 and AAMA2604 testing requirements. This coating is suitable for helicopters and low altitude aircraft and can be combined with heat reflective pigments for a cool coating. 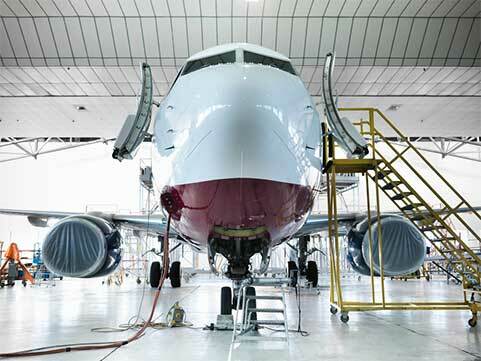 Naftoseal Sealants — Two component polysulfide based sealants for such applications as fuel tanks, fuselages, access doors, and floor panels. Water Scavenger — Kerojet Aquarius prevents phase separation of water in fuel, improving fuel efficiency, mitigating ice formation, and operational cost savings. It minimizes fuel tank draining procedures and the need for biocide tank treatments. Metal Deactivator — Keromet MD 100 prevents the breakdowns and oxidation of fuels and lubricants often promoted by trace metals, such as copper. Lubricant Base Stocks — provide exceptional thermal/oxidative stabilities, low viscosity profiles at low volatilities, and high flash points to turbine lubricant and synthetic grease formulations. Anitoxidants — prevent corrosive sludge and gum buildup in airplane engines with Irganox L06. This antioxidant helps extend the life of turbine engine lubricants by providing oxidation resistance. Fuel Tank Inerting System — Deoxo Fuel Tank Inerting System (FTIS) and the On-Board Gas Generating System (OBIGGS) Catalytic Ozone Converter protects your air separation membrane from degradation with FTIS/OBIGGS. Halogen-Free Flame Retardants — Melapur flame retardants are free of halogens, antimony or any other heavy metals and can be used alone or synergistically. Fire Extinguishing Agents — A comprehensive product range of agents against class A, B, and D fires. Lithium-Ion Battery Materials — BASF offers advanced cathode materials, innovative plastics, and customized electrolytes for battery applications. HED NCMs — BASF offers a portfolio of application specific cathode materials to support high energy density, safety, and improved efficiency for lithium-ion batteries. Radar Absorbing Technologies — Carbonyl Iron Powder absorbs radar and microwave radiation. Computer Aided Engineering (CAE) ULTRASIM — BASF's versatile, flexible, and predictive CAE tool reduces development time, tooling and parts count/complexity of reinforced thermoplastics while making mass optimization easy.